One of your favorite Stargate characters may never be the same after the direct-to-DVD Stargate: Continuum movie — and it's a pretty dark plot twist that closely mirrors a recent event on Battlestar Galactica. And speaking of BSG, there's a spoilery new video. 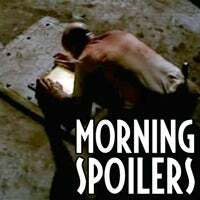 Other spoilers this morning include some facts — and our craziest rumors yet — about the British time travel soap-comedy Doctor Who. We've also gotten hold of five pages from an upcoming episode of the spy-computer-in-a-nerd's-head show Chuck... and our dweeby hero Chuck is discovering his seductive side. Seriously! Also, there are new images and details from the animated Batman: Gotham Knight DVD. It's time to spoil your television, people! And then Chuck has to seduce a woman named Sasha, with the help of Sarah and that Roan guy talking into his earpiece. (It's just like that Steve Martin-does-Cyrano movie Roxanne.) At first, Chuck gets shot down and some cool guy cuts in. But then later, Chuck does smooth talk about piano players. Later, Chuck is climbing on a balcony, and a woman thinks he's a peeping tom and steps on his hand. He falls, but lands on a mattress. Want to read some more completely unfounded rumors about the end of the current season of the BBC's time-travel saga Doctor Who? Well, too bad, here they are: returning companion Rose dies at the end of season four, and the Doctor and Jack are both devastated. Or wait, Rose doesn't die, but she and her family (plus Mickey) are sent back to their alternate universe again. Or wait, Rose never actually leaves the alternate universe — she can only appear in "our" universe as an intangible ghost. As the shadows rise and march, the Doctor forges an alliance with the mysterious River Song, as Russell T Davies's Bafta Award-winning time-travelling drama continues. But can anyone stop the Vashta Nerada? While the Doctor discovers long-buried secrets and revelations about his own future, the sinister Nodes declare that Donna is doomed. Continuum's script calls for Jackson to be on a wrecked ship in the Arctic along with Col. Cameron Mitchell and Col. Samantha Carter — but actor Michael Shanks, who plays Jackson, couldn't make it to the location filming in the Arctic. So producers needed a reason why Jackson would be there for the scenes on the boat, but not go outside into the exterior scenes. And they hit on the amputation idea. The direct-to-DVD animated Batman anthology, Gotham Knight, includes a segment written by former Bat-writer Greg Rucka, which deals with detective Crispus Allen's distrust of the then-new Batman. Cool moments include Batman coming through the flaming wreckage of a car and looking not-quite-human. And also Batman's shadow, projected by flames onto the dusted glass of the police squad room. And here are some new pics.